This past January, the SAU theatre department had the great opportunity to go to Des Moines, Iowa, and attend the annual Kennedy Center American College Theatre Festival. We received many awards and recognitions, but the biggest honor went to senior Hannah Donovan. In her time at Ambrose, Donovan stage managed The Tempest, Picasso at the Lapin Agile, A View From The Bridge, and worked on countless other productions. 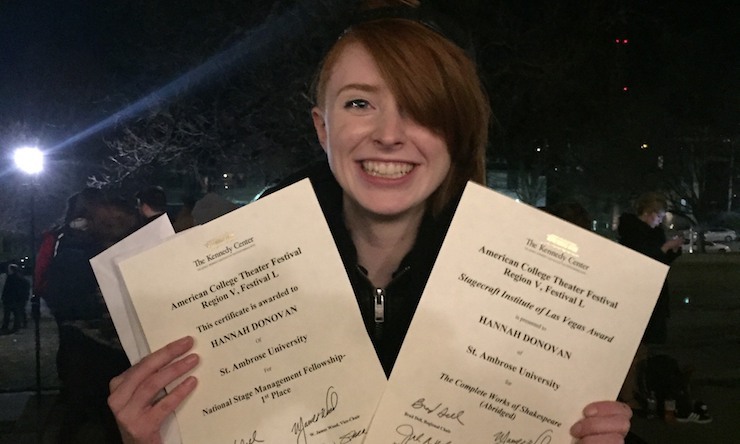 At KCACTF Region V Festival this past January, Donovan was chosen out of all of the region's stage managers to attend the national convention in D.C. later this month. We were able to ask her a few questions about her experience, because who better to explain than the person experiencing it herself! Q: What are you going to be doing at the Kennedy Center? A: From what I understand, the national conference is a condensed, elite version of the regional competitions. Actors and playwrights compete for scholarships and designers and stage managers take master classes. We all get to meet with professionals from the field and see shows as well. Q: How did you compete? A: Before the conference, I submitted a letter of intent and a letter of recommendation online to be accepted into the Stage Management event, and at the conference I stage managed an event (short play readings, in my case) and then was interviewed by professional stage managers about my ideas and views on stage management. The interview was also a critique on my prompt book, which I also brought to the conference as a part of the competition. We could not be more proud of Donovan as she goes on to pursue her dreams, and we know she will continue to astound us with her incredible work ethic and professionalism. 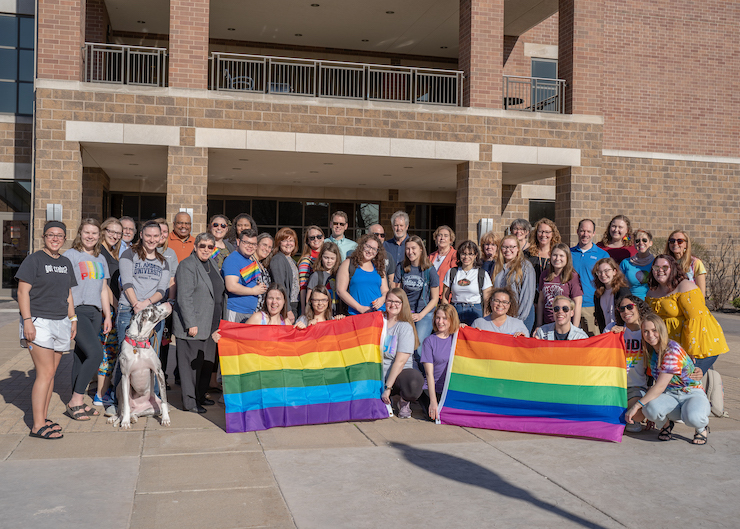 She will be flying out to D.C. this month with SAU's technical director Kris Eitrheim to attend the national festival, and we know that she will represent Ambrose as she always does: in the best way possible! Over the summer, she worked for the Mississippi Bend Players, where she stage managed three shows: Zombie Prom, directed by Broadway director Phil McKinley; Wait Until Dark, directed by Augustana College's Jeff Coussens; and Brighton Beach Memoirs, directed by SAU's own Dr. Cory Johnson.